Downtown Saint Paul route alternatives: We need your feedback! 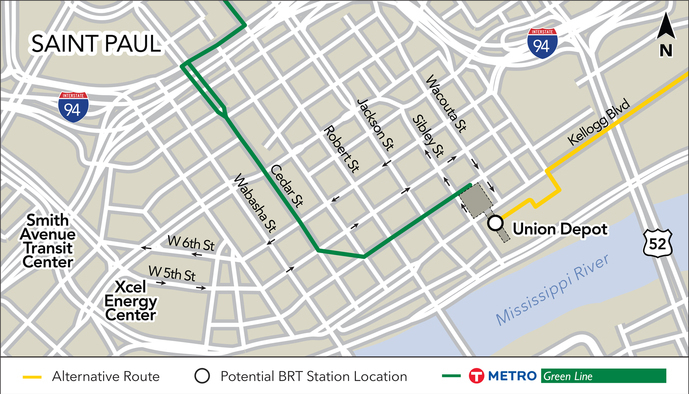 The Gold Line project office is exploring two route alternatives in downtown Saint Paul. One would have the route terminate at Union Depot. The other would continue the route through downtown (more details on both below). The project office is analyzing both options for cost, number of riders, potential impacts, transit connections and overall operations. Staff will present initial findings on Thursday, October 4, at the Gold Line Corridor Management Committee meeting, which starts at 2:30 p.m. at 390 Robert Street North in Saint Paul. Staff are also seeking public input on the preferred routing through downtown Saint Paul. There are a number of ways to provide comments, which will add to the feedback staff are collecting at pop-up events in the corridor. Find out details on the open houses and pop-up events. If you can’t attend an event, you can also provide comments through our online survey. Begin/End at Union Depot Alternative: The Gold Line will begin/end on the bus deck at the Union Depot, a multimodal transportation hub that provides transfer connections to the METRO Green Line and local bus service throughout downtown Saint Paul, as well as Amtrak, Jefferson Lines, Greyhound and Megabus services. Union Depot is also the planned terminus for additional future transitways. Route through Downtown Alternative: The Gold Line will begin/end at Smith Avenue Transit Center located at the corner of Kellogg Blvd and Smith Ave, across from the Xcel Energy Center. This alternative provides a one-seat ride through downtown that will also have stops in front of Union Depot on Wacouta Street and Sibley Street. 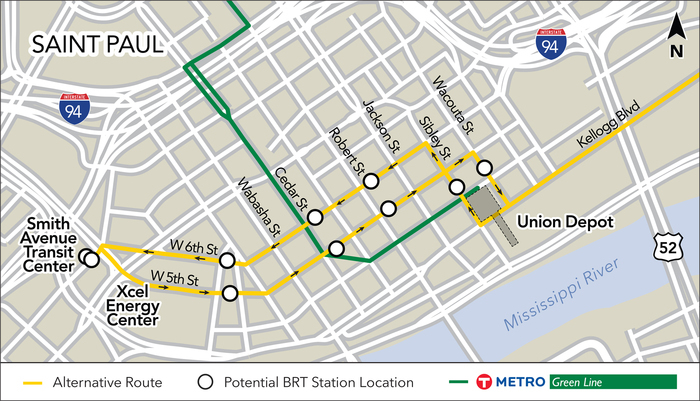 Between Union Depot and Smith Avenue Transit Center, the Gold Line will route down 5th Street or 6th Street. The CMC recommended that the station be located at Mounds Boulevard, and buses travel on bus-only lanes beginning at Mounds Boulevard and 3rd Street. This option was selected instead of a route on Maria Avenue with buses traveling in mixed traffic and a station at Conway Street. The CMC’s decision was based on the City of Saint Paul’s preference for Mounds Boulevard, and feedback from residents and bus operators who expressed concern with Maria Avenue’s narrow traffic lanes, winter snow piles, and sight-line issues. Between White Bear Avenue and Ruth Street, Gold Line buses would travel on bus-only lanes that will be built south of Old Hudson Road. There are two potential locations for the station: either at Van Dyke Street or Hazel Street. The CMC asked that project staff move forward with both station location options for the Environmental Assessment (EA), so both locations are still under consideration. The CMC recommended that Gold Line buses travel in mixed traffic on Hudson Road between Etna Street and White Bear Avenue rather than in bus-only lanes. In making their decision, the CMC kept in mind residents’ preferences for keeping on-street parking and two-way traffic and weighed the additional cost to build bus-only lanes in this area to the minimal gain in travel time. The next steps include analyzing these design decisions as part of the EA, which looks at the transportation, social, and environmental impacts of these design options. The EA document will be available for public comment in summer 2019. Get the latest Gold Line BRT updates by following us on Twitter @GoldLineBRT and Facebook @MetroTransitMN. The METRO Gold Line is a planned nine-mile dedicated Bus Rapid Transit (BRT) line that will connect St. Paul, Maplewood, Landfall, Oakdale and Woodbury generally along Interstate 94. This service is provided to you at no charge by Metropolitan Council.